With the increasing performance of machine learning techniques in the last few years, the computer vision and robotics communities have created a large number of datasets for benchmarking object recognition tasks. These datasets cover a large spectrum of natural images and object categories, making them not only useful as a testbed for comparing machine learning approaches, but also a great resource for bootstrapping different domain-specific perception and robotic systems. One such domain is domestic environments, where an autonomous robot has to recognize a large variety of everyday objects such as groceries. This is a challenging task due to the large variety of objects and products, and where there is great need for real-world training data that goes beyond product images available online. 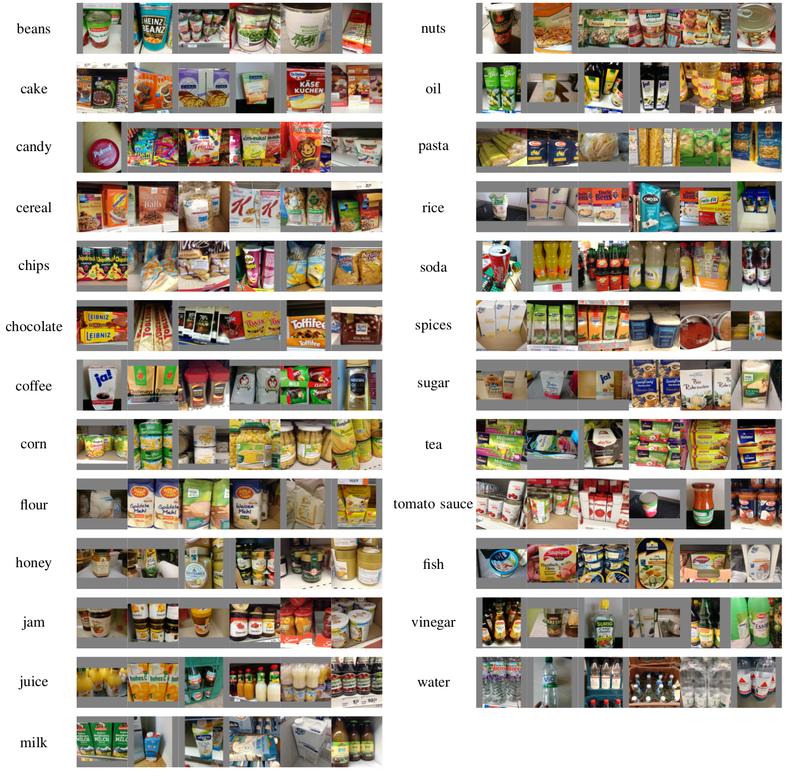 In this paper, we address this issue and present a dataset consisting of 5,000 images covering 25 different classes of groceries, with at least 97 images per class. We collected all images from real-world settings at different stores and apartments. In contrast to existing groceries datasets, our dataset includes a large variety of perspectives, lighting conditions, and degrees of clutter. Overall, our images contain thousands of different object instances. It is our hope that machine learning and robotics researchers find this dataset of use for training, testing, and bootstrapping their approaches. As a baseline classifier to facilitate comparison, we re-trained the CaffeNet architecture (an adaptation of the well-known AlexNet) on our dataset and achieved a mean accuracy of 78.9%. We release this trained model along with the code and data splits we used in our experiments.